Gray skies but not the forecasted showers greeted us as we touched down at the international airport 25 miles away from Iceland's capitol city of Reykjavik ("ray-kah-veck"). 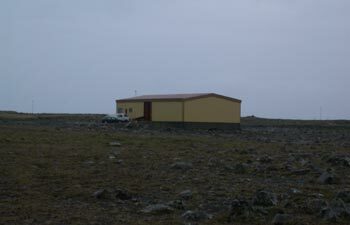 I clutched at the sight of the unexpectedly bleak, flat land and despite the bright paint, the clusters of modern buildings seemed reminiscent of an isolated polar research station. The ubiquitous though attractively done corrugated metal roofs (and sometimes siding) added to the 'hunkered down' look of the eve-less, low-pitched roofs. The palette of terra cotta, buttery yellows and slate blues succeeded in their thinly-veiled effort to use the architecture to add some visual liveliness, but the starkly functional look of the homes and commercial buildings shouted that survival was the only priority around here. The modern concrete and metal buildings seemed out of place on this tundra-like land--land that looked like it was at the 7,000 to 8,000' level in the Alps and instead should be sprinkled with charming wooden chalets. None of the vegetation was over knee-high and most of it was the low, bunchy grasses and mosses of the high mountains. We were essentially at sea level and the high-altitude look instead was coming from the high latitude, as Iceland almost touches the Artic Circle. And even though the immediate terrain was generally flat, the gnarled, exposed volcanic rock suggested that everything about living on this barren land must be hard. The high-clearance bus we rode into town seemed to have an amphibious heritage and its ruggedness only added to the feeling of "What have we gotten ourselves into?" The bus unexpectedly dumped us out at an isolated terminal building, leaving us without a clue as to how to get the rest of the way into town. The biting cold wind and desperate look of our surroundings made me quickly willing to shell out the $10 for a taxi rather than sorting out the public transportation situation as we would normally do. There was nothing normal about this place and a part of me was eager for some comforting and reassurance that we weren't going be stranded in the Twilight Zone. Reykjavik's urban core had the same scoured-clean look as the surrounding countryside--like a sand-laden wind had come through, followed by a wind that then carried the sand away. The mid-afternoon temperature was in the mid 50's F, but the wind and the generally wintry feel of the city made it easy to imagine that there would be an evening snowfall. Even being inside the grocery store reminded me of being in a winter sports area, though it was hard to pinpoint what triggered those feelings. Some winter sports areas, like Aspen, Colorado, completely shed their winter image come summer and yet in mid-July Reykjavik seemed to actively projecting the spirit of the past winters. Public art in the downtown area. The severity of the hilltop Lutheran cathedral and the starkness of the public art on the streets seemed to exaggerate rather than soften the foreboding feeling in town. The coldness of the gray skies must have influenced my interpretation of this metal sculpture as I saw it as depicting frozen bodies emerging from blocks of ice. 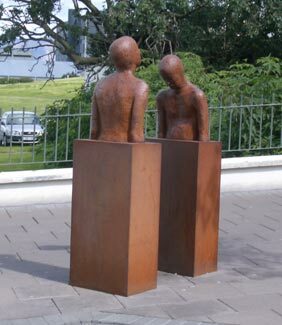 Other metal sculptures around town also seemed to emphasize unwelcome solitude and lifelessness. Had I been on the town's public art committee, I would have favored a bit of color and joyous whimsy for the public spaces. And Reykjavik's population of 180,000 just wasn't enough to energize the city and it instead felt like a place that was leaking out its life force. 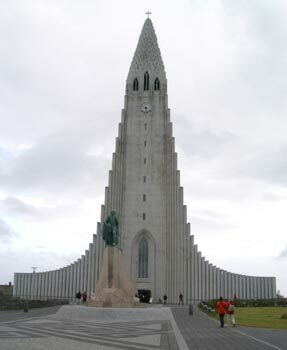 Seventeen days was looking like a very long stay in Iceland. We held our breath as our first stop after stashing our luggage at our Reykjavik guesthouse was the grocery store. We knew sticker shock was going to be profound as our modest 'toilet & shower down the hall' room was about $85. I have a special little spread sheet program on my handheld computer that I use for recording the most important traveler's words for each country we visit, but I immediately could see that in Iceland it would be used for comparison shopping for groceries. We couldn't make our "buy/don't buy" decisions based on what was a reasonable price but instead would have to resign ourselves to recognizing what was a low price by Icelandic standards. As Bill put a few things in our basket, I busily recorded the prices for fresh and frozen produce. It didn't take long to know that there would be no impulse buying or buying out of habit here--nothing could go in the shopping cart without translating the name and then converting the price. That bag of fresh carrots we instinctively reached for (and then put back) was $8, the bag of frozen broccoli we passed by was almost $10, as was the fresh broccoli. Along with striving to eat 10 servings a day of fruits and vegetables, we always include some carrots, citrus fruit and something from the cabbage/broccoli family. We quickly decided that we'd be eating the much more affordable cabbage in Iceland and carrots and broccoli will drop off the daily menu. But I felt like I had trophies in my hand when I found cauliflower that was in a clearance bin just prior to being thrown out. Like other people through most of Iceland's history, eating for us was now more a matter of survival. We would have to wait to leave the country to savor strawberries, peaches, and melons as the prices were just too high and the quality far too low to be inviting. Our food hoard hauled from London. To take the sting out of the high prices in Iceland, we lugged along an extra 25 pounds of food in our baggage (thinking it was half that weight 'til I just now carefully tallied the numbers). 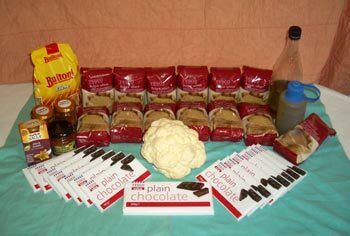 That included enough bulgur (cracked wheat) and olive oil to eat for breakfast and enough dark chocolate for our lunchtime ration for our entire stay. We also tossed in enough of our favorite Italian pesto sauce for a week, a bag of pasta and a head of cauliflower for our first dinner. Not until we were in Iceland did we see the 6 pound per-person limit for bringing food of any kind into the country. But our total hoard amounted to about $50, which was well under the close to $200 per person limit they impose--clearly they aren't after the unwitting bulgur smugglers. Never before have we seen a weight limit on food carried in luggage. But amazingly, when entering Iceland ordinary groceries get listed along with cigarettes and alcohol as regulated commodities. I will keep my whining about Icelandic prices to a minimum after this tantrum, but it really is outrageous and seemingly without good explanation. Little pocket field guides to birds, rocks or flowers that we might pay $15-20 in the US ran about $65 in Iceland. A book published in Germany on cycling in Iceland had the Euro equivalent of about $15 printed on its back was selling for $43. Most of the tourist oriented books on Iceland that are published in Iceland sell for around $50. Amazingly, a book on Iceland that's printed in Denmark that I ordered online in the States is $10 less in than than it sells for in Iceland. And the very thin international edition of the Herald Tribune newspaper that sells in the far reaches of Europe for $1.80-2.00 sells for $3.70 in Iceland. Whether the goods originate in Iceland or not, most of the grocery store items are 2 to 5 times higher than what we generally pay in western Europe. And, just like our guide book warned, bottled water was more expensive in Iceland than auto fuel or as we discovered, even orange juice. In France, the local budget brands of bottled water started at about 20 cents, in Iceland the local bottled water at the grocery store was over $3. The tax doesn't explain it, as their tax that appears to range from about 14-24%, which is pretty standard throughout Europe. We no longer had to imagine how the Eastern Europeans feel when they travel into Central and Western Europe--we experienced the living standard difference first hand. Our Iceland guide book states that the food prices are about 3 times higher there than in Europe because everything is shipped in. “Sounds reasonable” was my first thought. But then I remembered all those South African purple grapes that I bought in France that are cheaper than the French grapes, and the Spanish strawberries that are cheaper in France than the French strawberries. And I thought back to purchases back home where the Italian pasta we buy at Trader Joe’s is only pennies more than we pay for it in Europe and that New Zealand apples can be shipped to the apple growing region in Oregon and still be sold at competitive prices. And then there is the fact that shipping by sea is outrageously cheaper than overland costs by truck or train. It's like there is a gatekeeper in Iceland pocketing a huge amount of money and keeping the prices in Iceland artificially high. We only expected the food prices to get higher after we left Reykjavik, so we purchased more food to add to our luggage hoard before leaving on our trek around the island. We stashed away enough pasta for our dinners and tuna for lunches for the rest of our stay, as well as topping off our supply of pasta sauce that we brought with us. We bought a week's worth of a hearty dark bread and rye crackers for our lunches, plus 11 pounds of cabbage, 3 pounds of apples and about 3 gallons of orange juice. These are economies that we wouldn't be able to indulge in were we traveling by bike but could as car travelers. Our small but nutritionally sound hoard seemed even less foolish after learning that a portion of the student body at an Icelandic agriculture college contracted scurvy from the nutritional-wanting cafeteria faire. Stocking up on all this food made me feel like we were embarking on some great, hazardous sea voyage or heading out into some uncertain land crossing. It was odd to realize the only threat or uncertainty that we were provisioning ourselves against was high prices. When our airport bus dumped us at the bus terminal just out of Reykjavik's core, we spotted a couple of bikes loaded for touring. Pangs of shame and envy shot through me as I heard "That's what we planned on doing." The cold wind and threatening skies helped ease the longing but the same feelings were triggered the next day at the post office, as one of the stamps I purchased had 3 cyclotourists featured on an Icelandic road. I vowed to ask for email addresses from the next cyclotourists we saw so I get could some first hand reports after their journey was completed. My chance to make contact with a bike traveler come the next morning in Reykjavik. The twenty-something Polish man arrived in Iceland the same day we did and he already had tales to tell. After breaking camp in the rain, he had spent too much of his day of riding at only 5 miles per hour because of the wind, rain, and the unexpectedly rough road. He did this arduous ride without food or water (something we have never done). I was amused to learn that he too shipped food into Iceland, though his was mailed. I hoped for his sake that the controls at the post office would be as lax as at airport customs. His similar strategy also made me wonder just how many other tourists soften the blow of Icelandic prices by carting provisions into the country. After a long chat, I made note of what was distinctive about his equipment and silently vowed to share food with him if we saw him on the road as it will be hard for him to carry enough, especially traveling alone. Unfortunately his website isn't working but we'll email him after he returns to Poland and hope to learn more of his trip. As we left this man and his undoubtedly still-wet tent, I thought again of our guide book's worrisome comments about the potential harshness of the cycling conditions. Comments like needing a tent to sit out 2 to 3 day sand storms should they come up and being prepared for sudden, drenching squalls didn't sound like fun. And the websites I checked out for organized bike tours mentioned their back-up vehicles that would transport the bikes across high water areas--not our kind of biking. Even camping in Iceland sounded too harsh for us as car travelers. Though camping would range from free to $20 per night and keeping our guesthouse and hostel costs down under $100/night for two would require vigilance and careful planning, it seemed like the right choice for us. And once we arrived, the forecast of rain for 12 of our first 14 days in Iceland made the decision not to camp look even better. It had only taken a few hours in Reykjavik to appreciate having a room into which we could escape the endless, chilling winds. While in Reykjavik, I made a point to remember my conflicted feelings about not being on our bikes so that I could compare them with my feelings after we had toured around Iceland by car for 2 weeks. For months we had planned on biking Iceland and only when the ferries out of Scotland were unavailable did we decide to fly and leave the bikes behind. It was a difficult decision and it was hard to let go of our images of the bike trip. We also lamented the deconditioning that would set-in with almost a month out of the saddle. There were immediate changes to deal with in Iceland, the first being the language and the money. The language has a soft, rolling sound that left me with little hope of catching any individual words. We'd take a stab at learning our basic traveler's words but I suspected we'd be limited to sign language and English to communicate. Fortunately, many Icelanders are multi-lingual with English and several of the Scandinavian languages. And like in England, we had left the Euro behind and had yet another currency conversion factor in our heads. Our 10 days in England had scrambled our brains with the left-handed road driving but at least in Iceland we were on familiar territory in traffic, which was especially important since we were renting a car. Differences we didn't expect were in our home environment. All through Europe we have usually been treated to layers of window coverings to darken our room at night, often having shutters or rolling outdoor blinds plus heavy drapes. But ironically, here in Iceland where it doesn't really get dark at night in the summer, one of 2 windows in our Reykjavik guesthouse only had lacey sheers and the other window had a light-transmitting curtain with the heft of bed sheet. Perhaps shutters bang around too much in the harsh winds, but it is hard to imagine why they don't favor room-darkening drapes for a good night's sleep in the endless summer brightness. After having made our first contacts with Iceland by exploring the grocery store and life in our guesthouse room, we headed out for a less serious look at Reykjavik. The first stop, which proved to be a much longer walk than expected, was the city library. We laughed, as this very fresh and modern building was completely surrounded by a moat of water. The fortress look isn't what most libraries strive to project these days and it echoed the lonely, isolated theme of the street art in the heart of town. At the library we hoping to further our cost cutting campaign by finding free internet access mentioned in our guide book and by catching up on the news without having to pay for a newspaper. The journey was marginally successful as the internet wasn't free after all and the few English newspapers were days and weeks old. The good news was that there was no reason to make this long walk a second time. But the bonus was that on the way we stumbled across the huge city cemetery. In contrast to most of the city where any vegetation looked frail and recently planted, the cemetery was practically a jungle of lush, established plantings. 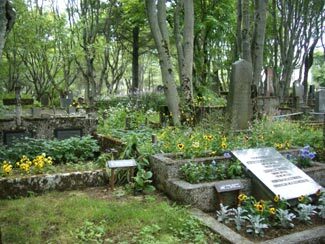 Most European cemeteries are pretty barren, being packed with above-ground granite sarcophagi and the only greenery being freshly cut flowers. But this Reykjavik cemetery had more the look of an allotment (community) garden. Most of the plots were raised earthen beds bordered with stone and many had at least one deciduous tree planted along with flowers you might find in a 19th century garden. Some plots also had a patch of grass growing and the narrow paths between the plots were soft earth like on a forest trail. Lacking the harsh lines of most cemeteries, it was a place that invited us to linger. And after reading about the few prized planted forests in Iceland, I could imagine that this cemetery would be the lushest, most densely vegetated place we would see in Iceland. The cemetery was actually one of the highlights of our out-and-about time in Reykjavik as even while in France we knew that we would miss the premier historical museum in the city. Our Iceland guide had said it was due to open any day and we tried to plan our travels around the museum's reopening date. We had checked their website and finally called tourist info for the opening day. The woman at tourist info could only sputter when I pressed her for more information and she refused to comment beyond "They say in September". Further looking at the web revealed that this museum has been on the verge of reopening for no less than 6 years. That made the French museums look a little better as in France about a third of the museums we tried to visit were closed for explained or unexplained reasons or significant portions of the exhibits have been removed from display. First day with the upgraded-for-free rental car. It only took a few hours in Iceland for us to tentatively put it on the "Nice place to visit...." list and Bill was joking about going to Spain before we even made it back to the hotel from our first grocery shopping trip. The barren land, the harsh climate, the geographic isolation, the high prices and the battered looking produce seemed like they would be too wearing for a lifetime. And the faces of some of the people of the street suggested that life here is indeed too hard for some. We of course knew that many spectacular sights awaited us as tourists and were curious to see if we could imagine living in Iceland after getting to know it better. 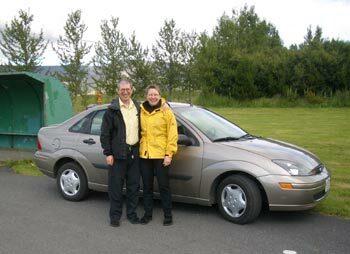 So, after orienting ourselves to Iceland and provisioning during our 2½ days in Reykjavik, we were anxious to pick-up our rental car and head out on the real journey all the way around Iceland. Ironically, we were greeted by a heat wave and a still-ongoing series of flash floods when we returned to London after weeks of cool, windy weather in Iceland. After a little sightseeing in and around London we were happily reunited with our bikes. But Bill tweaked his knee while walking in Iceland and our second full day on the bikes ended with a sudden episode of pain in the same knee. He let the lame leg dangle as the other pedaled alone for the remaining mile or two to our lodging for the night. We are now hotel-bound in Peterborough north of London while in the "wait and see" phase of assessing if this is a trip-ending injury or just an extension of our forced-rest interval. He doesn't have a clue as to what is amiss as it is unlike our previous knee problems. Though he was sure surgery was in his future when it happened Sunday night, the inactivity, ice, ibuprofen, and elevation seem to be working their magic and we hope to be riding again later this week.